President Barack Obama speaks by the Sentinel Bridge, in front of the Yosemite Falls, the highest waterfall in Yosemite National Park, Calif., June 18, 2016. President Barack Obama stressed his administration's efforts to improve the environment during a visit to Yosemite National Park Saturday, but said much more needs to be done to safeguard the natural beauty of such preserves. The president, first lady Michele Obama and their daughters, Sasha and Malia, drove through dense forest on steep mountain roads, enjoying breathtaking views of snow-capped peaks and lush valleys in the first park land set aside, in 1864, just for preservation and public use by an act of the U.S. government. The area was originally ceded to California as a state park but became a national park in 1890. Stopping at a high elevation, the Obamas alighted from their motorcade and set out on an hourlong trek through a wilderness section of Yosemite, leaving cameras and reporters behind as they walked in relative solitude. The Yosemite visit was part of a Father's Day weekend excursion for the family, and a celebration of the 100th anniversary of America's national park system. Yosemite, over 3,000 square kilometers in size of mostly undeveloped wilderness, and its scenic beauty is one of the top U.S. attractions for Americans and foreign visitors alike. 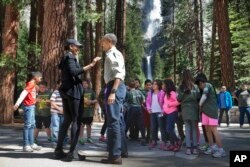 First lady Michelle Obama and President Barack Obama meet with children during the "Every Kid in a Park" event at Yosemite National Park, Calif., June 18, 2016. The Obama family traveled to Yosemite to celebrate the 100th anniversary of the creation of America's national park system. The moon was rising over Half Dome, a massive granite formation that is one of Yosemite's icons, when the Obamas arrived at sunset Friday, following a visit to New Mexico. At midday Saturday in California, the president delivered some brief public remarks, standing near Yosemite Falls, a 700-meter cascade of water that pours down a sheer mountainside. Obama said park rangers explained that Yosemite is already experiencing the effects of climate change: meadows are drying out, bird migrations are shifting elsewhere and higher temperatures are sending some animals to higher elevations. Since taking office in 2009, Obama said his government has protected well over 100 million hectares of public lands and water, more than any other previous U.S. administration. A large part of the protected land is a marine sanctuary located in the Pacific. He also cited his administration's victories in providing endangered-species protection for animals including the Louisiana black bear. Above those accomplishments, however, Obama praised Yosemite as "a park that captures the wonder of the world. ... There's something special about this place." The park is 275 kilometers east of San Francisco in eastern California, and it has been a federal preserve for 150 years -- longer than the national park system -- the president noted, since President Abraham Lincoln "first protected the ground on which we stand." Obama has added 20 sites or monuments to the national park system while in office. Half of those were approved by Congress, while Obama created the other half by using the Antiquities Act, a law signed in 1906 by then-President Theodore Roosevelt, an early advocate of preserving the nation's natural resources. For Obama, who has made the fight against climate change a priority during the past eight years, in the face of opposition by the Republican-controlled Congress, the law has been a good way to take action on environmental issues. "There is plenty to celebrate when looking at the past 100 years" of the parks system, Obama said Saturday. But he added, "When looking at the next 100 years, the task of protecting our parks is more important." "Make no mistake, climate change is no longer just a threat. It's already a reality," he said. "Yellowstone's glacier, once a mile long, is almost gone," Obama said. He said rising temperatures could mean no more glaciers in Glacier National Park, no more Joshua trees in Joshua Tree National Park. "That is not the legacy we want to leave behind," the president said. 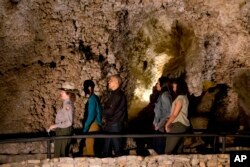 A member of the National Park Service, left, leads Malia Obama, President Barack Obama, first lady Michelle Obama and Sasha Obama on a tour of Carlsbad Caverns in Carlsbad Caverns National Park, Carlsbad, N.M., June 17, 2016. On Friday, Obama, his wife and their daughters toured a maze of caverns beneath the desert at Carlsbad, New Mexico, before flying to Yosemite, the country's oldest national park. The Interior Department says tourism at national parks this year are on pace to beat last year's record of 305 million visitors, who spent $16.9 billion in and near the parks. Some members of Congress accuse Obama of overreaching his authority and argue that the government should not acquire more land until it can end a backlog of maintenance projects for current parks. Environmental groups have urged Obama to do even more to preserve public spaces before he leaves office in January. NOTE: This story was updated to clarify information on the designation of Yosemite as a national park.